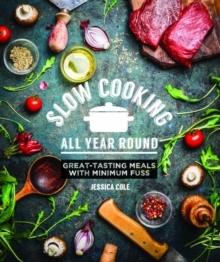 Great tasting meals with minimum fuss is the Slow Cooking way...This cookbook gathers many traditional favourites showing you how to cook them low & slow so they will become your go-to signature dishes that require little to no effort. This phenomenally popular style of cooking is budget-conscious taking tougher cuts of meat & turning them into delicious, tender, juicy & hearty meals for the family. Despite the longer cooking times, slow cooking generally requires shorter preparation time leaving you to get on with 'life' whilst dinner gently bubbles away. Plus, cooking meat, vegetables & sauce together in the one pot cuts down on your washing up too and you've got to love that! You don't need specific equipment - there are many ways to slow cook food. Simmering in a stockpot on the stove top; baking in a casserole dish in your oven or with a slow-cooker or pressure-cooker.